The re-release of our best selling children's CD of all time. Featuring classics such as 'Isaiah 53:6' and 'The One And Only God', the CD now includes sheet music, backing tracks and overhead masters as well as a colouring book - all on the CD itself. Remember The Lord CD by Colin Buchanan was published by Authentic in January 2002 and is our 15348th best seller. 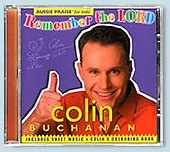 The ISBN for Remember The Lord CD is 9323078008831. Be the first to review Remember The Lord CD! Got a question? No problem! Just click here to ask us about Remember The Lord CD.